Battle of the mats – can you really get a good night’s sleep bikepacking? “Sanny!” It was Mark on the blower. “We have a couple of sleeping mats we want you to test. It should be right up your street for all your bikepacking adventures!” Without even knowing what I was getting into, I was already in. “You know that I’m not one to be asleep on the job but in this case, perhaps I should sleep on it?” Mark groaned at my pun. Not one to be discouraged, I kept going with the theme. “Is your iPad making you feel sleepy? There’s a nap for that!” …silence… “Did you hear about the thief with insomnia? He was resisting a rest!” Mark sighed. Clearly, he has no soul! “So what am I testing then?” “An Exped Downmat Winterlite mat and a Thermarest Camper SV” he replied. And so it was that two sleeping mats arrived at my door and which have since been subjected to some fairly gruelling testing over the last twelve months. Doing a review over a few weeks is fine but when it comes to sleeping mats, I’m much more interested in seeing how robust they are in the long term. Questions like how puncture resistant they are and whether they are comfortable night after night matter to me. We spend so long asleep that getting the right mat to lie on is crucial. There are few things as disheartening as a mat that slowly deflates overnight and which leaves you chittering in the cold. With this in mind, let’s take a look at what these two mats have to offer. 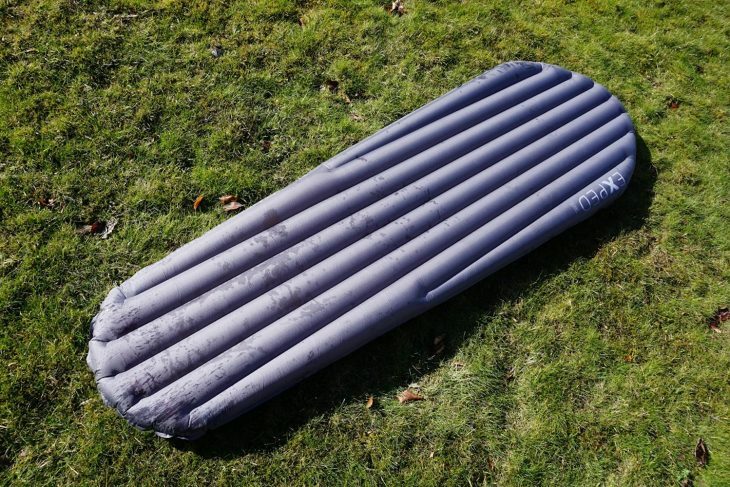 The Downmat Winterlite LW is Exped’s range topper sleeping mat aimed at those who think nothing of sleeping in sub-zero temperatures. Weighing in at 781 grams, it isn’t going to win any awards for being the lightest mat on the market. Heck, you can buy a mat that weighs half that. However, that would be missing the point somewhat. The Downmat Winterlite LW comes with an R value of 7 (R value being resistance to heat flow through a given thickness of material – the higher the value, the warmer the mat). In practice, this means the mat is rated down to -32°C. An industrial freezer is usually somewhere around minus 20 degrees centigrade. Those are impressive numbers. One downmat reporting for duty, SIR! Constructed from highly durable 20D Polyester (which resisted all ham fisted attempts to inadvertently puncture it during the duration of the test), the mat is filled with 700 fill power goose down which has been responsibly sourced. Designed with a tapering mummy shape to save a little weight (a non-taper version is also available), the mat is over 77 inches long, 25.6 inches wide at the shoulder and some 3.5 inches thick. The air chambers run horizontally along the full length of the mat with internal baffles which act to keep the down spread evenly throughout while the baffles at the side are raised which does a remarkably effective job of preventing roll off. 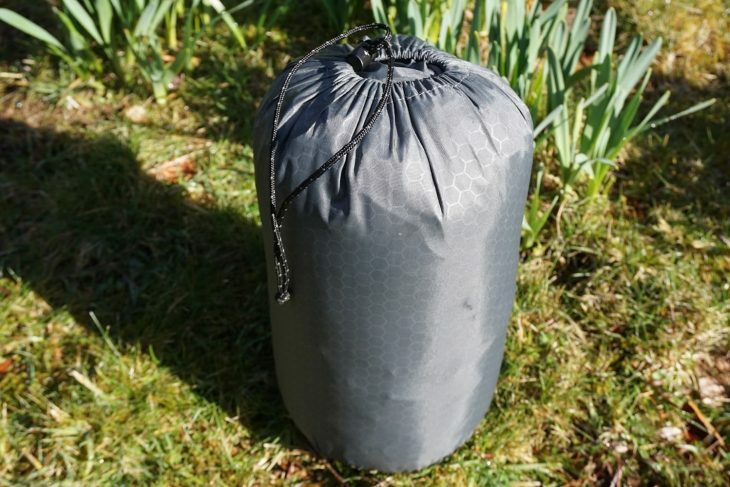 Inflated and ready for action – morning dew not included in the price but available from all good camping spots! Being some 6ft 1in, I opted for the LW (long and wide) version and found that I had plenty of room to sleep comfortably. Shorter and narrower versions are available for the vertically challenged and for those who prioritise weight saving over all. Packed down, the mat fits easily into its storage bag. No creative sweary words required. I measured the bag at 28cm by 15cm although I reckon a compression sack could reduce that a little. So now the important bit. What’s it like to use? 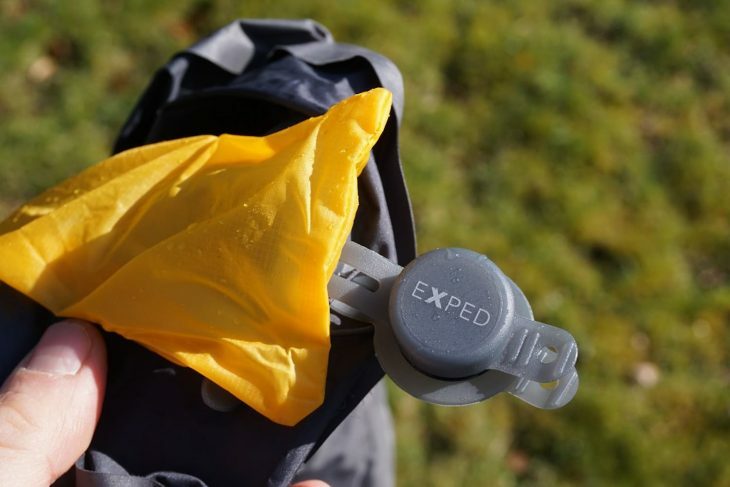 First and foremost, Exped supply the mat with what they call the Schnozzel bag. 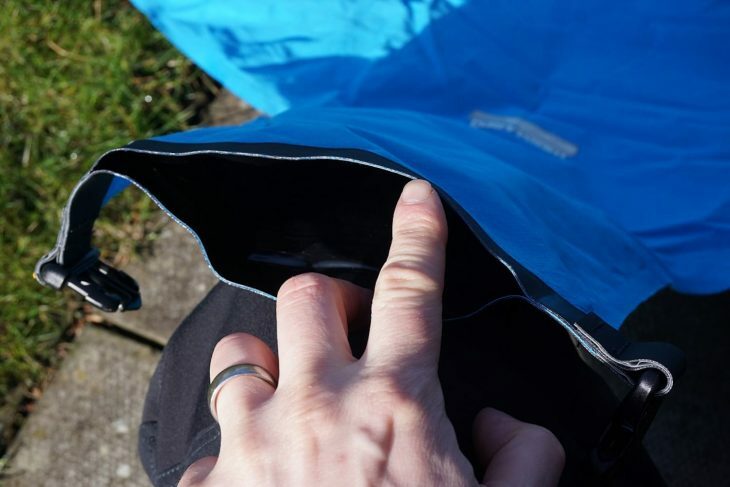 This is basically a dry bag with an adaptor plug inset at the base. By plugging this into the one way valve at the top of the mat, by moving the bag to capture air and then sealing the end, the bag is squeezed down and the mat is filled. The really rather brilliant Schnozzel Bag. With a little practice, I managed to get the bag inflated with only four pumps from the Schnozzel bag. The technology is exactly the same as employed in packrafts and is really rather brilliant in its simplicity. 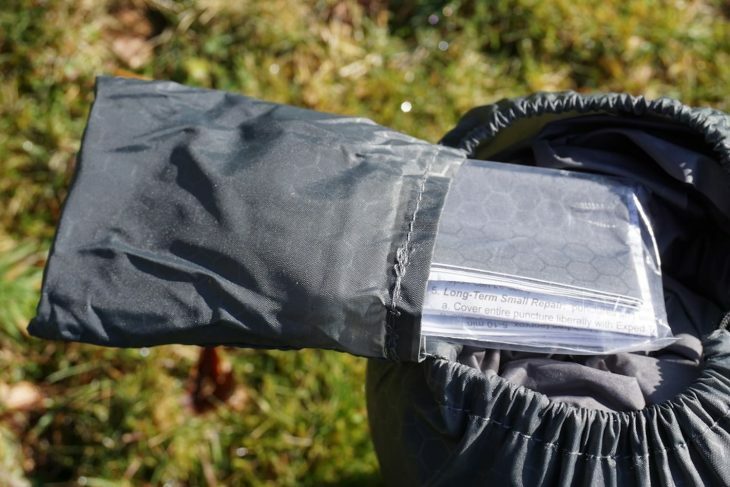 Aside from making inflation a breeze (Enough already with the puns – Ed), the Schnozzel bag prevents unwanted moisture getting into the mat which can potentially lead to mould and compromising the insulation. Down and moisture do not comfortable bed fellows make. Plug in the bag, catch some air and away you go. Zero to inflated in four squeezes. Once inflated, I found the mat to be supremely comfortable. The internal baffles mean that there were no cold spots anywhere on the mat, something I have experienced with cheaper mats in the past. I’ve traditionally preferred horizontal baffles on mats but I grew quickly to appreciate the comfort of the vertical design. The size of the mat meant that I was able to do my usual fidgety tossing and turning but not once did I find the tapered foot design an issue. Rather, I was able to enjoy many good night’s sleep in my usual snoring manner. Moreover, when I woke up the next morning, I never found my head or feet popping over the end of the mat. Warm, comfortable and durable. Win! In terms of cold weather performance, I decided to put the mat to the test properly by setting up camp high on the Cairngorm plateau in the middle of winter. The ground was frozen solid to the extent that I had serious trouble getting my gas stove to work. It must have been around -10°C overnight. However, the mat performed as expected. I was warm and cosy even though I opted for a lighter sleeping bag than I would normally use. The down insulation makes a very noticeable difference compared to other mats I have used. In warmer weather, it has allowed me to use my super lightweight sleeping bag beyond its normal minimum temperature rating. I reckon that is pretty impressive. 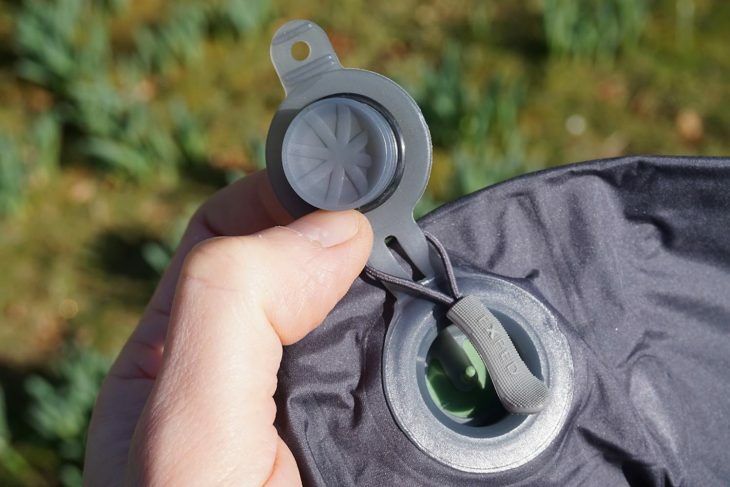 Toggle presses against the green valve for easy deflation. Would I buy one? 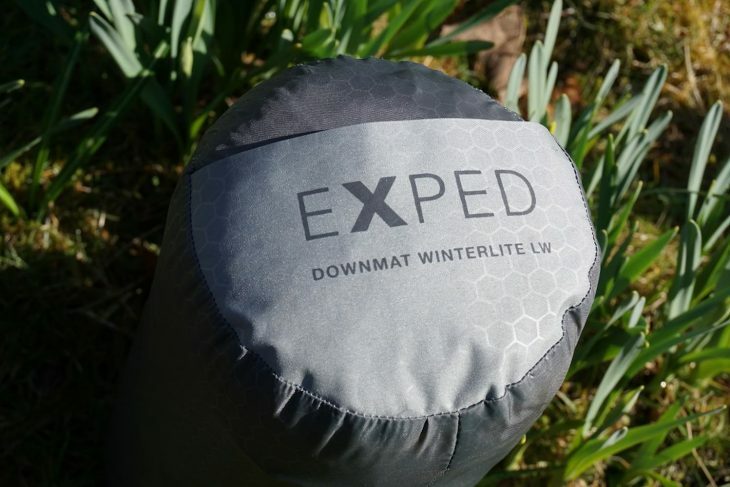 For serious winter bikepacking, I think the Exped Downmat Winterlite LW would be extremely difficult to beat. 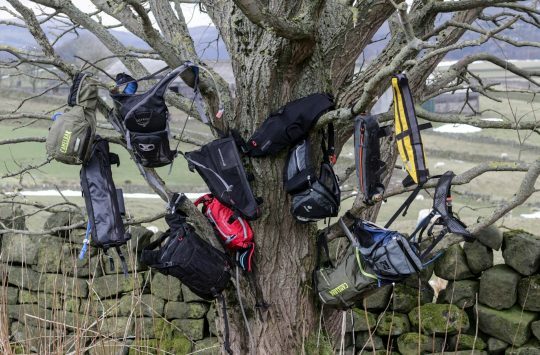 It is incredibly warm for the weight, the pack size is decent for something so capable and the few extra ounces of weight it carries over superlight designs are more than offset by its performance and comfort. It isn’t a cheap option. In fact, it is one of the most expensive mats on the market but as I lay on the ice contemplating the relative price versus performance tradeoff, I was very glad of the mat. No more winter nights of broken sleep and shaking like a sh#tting dog for me! Neat built in repair kit – I never needed to even look at it during the test. If the offering from Exped is the middleweight contender, the Thermarest SV Camper is definitely the heavyweight offering. Weighing in at a not insignificant 1045g including bag and repair kit, the Camper SV is aimed more at the basecamp and family car camper than bikepacker. 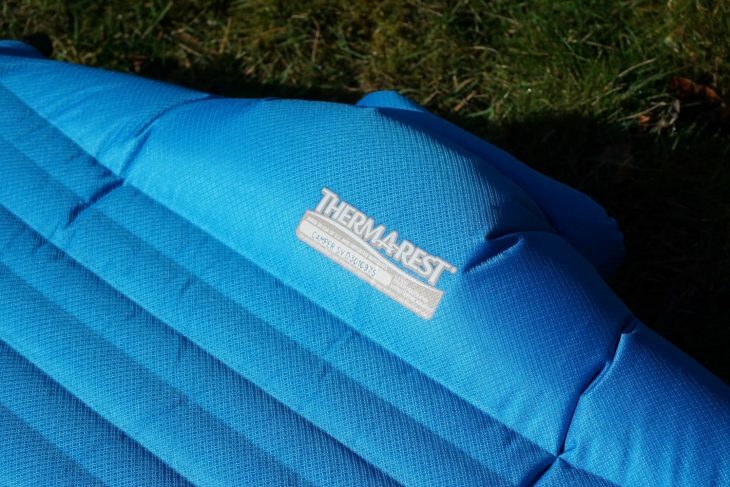 However, there is some technology in there that Thermarest has trickled down into its lighter weight offerings which is very much worth a look at. The Thermarest hung in the air like a brick doesn’t. At 25 inches wide, 77 inches long and 3 inches thick, the mat is almost exactly the same dimensions as the Exped, albeit without the taper foot design. Coming in a very natty Mediterranean blue, the bag oozes quality. The construction looks and feels first rate and as with the Exped, I singularly failed to damage it in any way during the duration of the test. With an R rating of 2.2, I found the mat to be good down to temperatures approach zero. However, below that, I was reaching for the Exped instead. If it is a winter mat you are looking for, this isn’t it. Doesn’t appear that they spent much time designing the stuff sack. Inflation of the mat can best be described as ingenious. 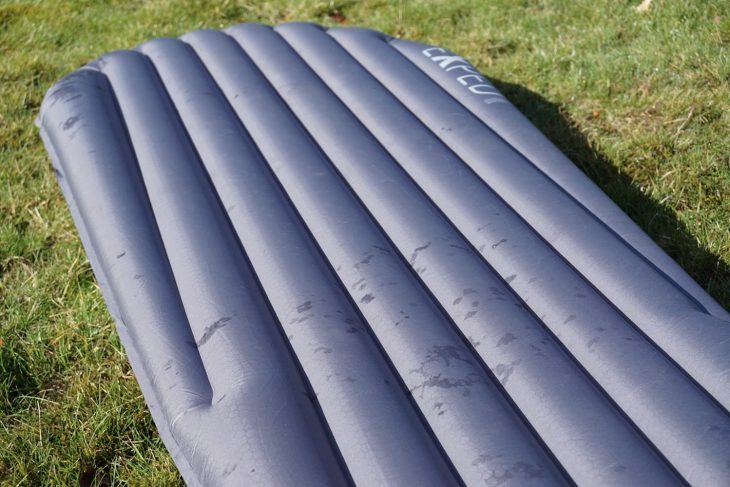 Using its own Speedvalve technology, Thermarest has employed clever science and developed an inflation technique that will have you leaving your fellow campers blowing into their mats in your wake. At the head end of the mat is what can best be described as a dry bag opening. Calling Mr Bernoulli… Mr Bernoulli to the campsite please! Within this, there is a black, open ended cuff that looks and feels like a heavy duty bin liner. By placing the cuff inside the bag and blowing into the opening from a few centimetres away, surrounding air is drawn into the bag. 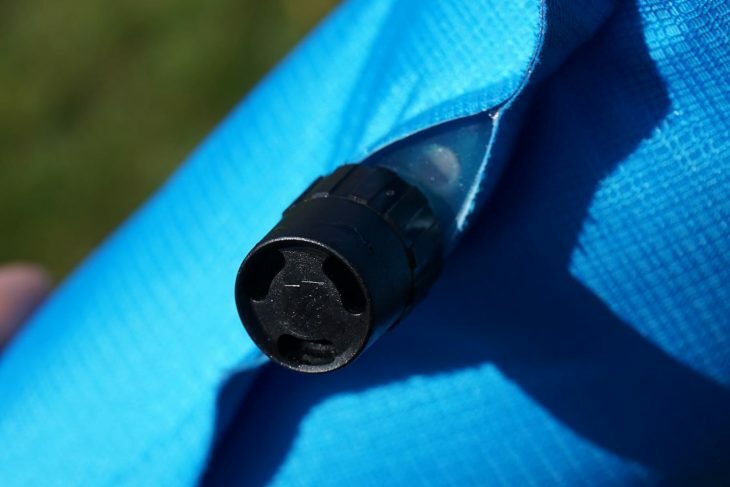 The cuff acts to prevent the air rushing back out when you close the dry bag opening over between puffs. The black bit where the magic happens. It’s what is known as the Bernoulli principle. 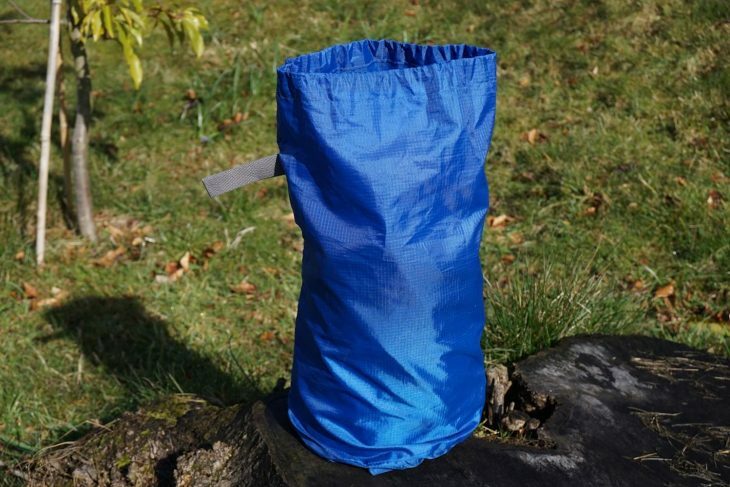 Given that moving air has less pressure than still air, by blowing air into the bag, surrounding air rushes to fill in the lower pressure area and is drawn into the bag. Unlike a normal sleeping mat, you are effectively increasing the amount of air being put in for each time you blow. I have to admit that every time I inflated the mat, it made me chuckle. Science like this is quite simply cool! My eight year old daughter loved it and would always shove me out of the way to try it. Once inflated, the mat was impressively comfortable. It has a flatter profile than that of the Exped while at the head end where the dry bag opening seals, there is a small bulge which does an excellent job of preventing my inflatable pillow popping off the top. I have tried several Thermarests over the years and the Camper SV is easily the most luxurious. 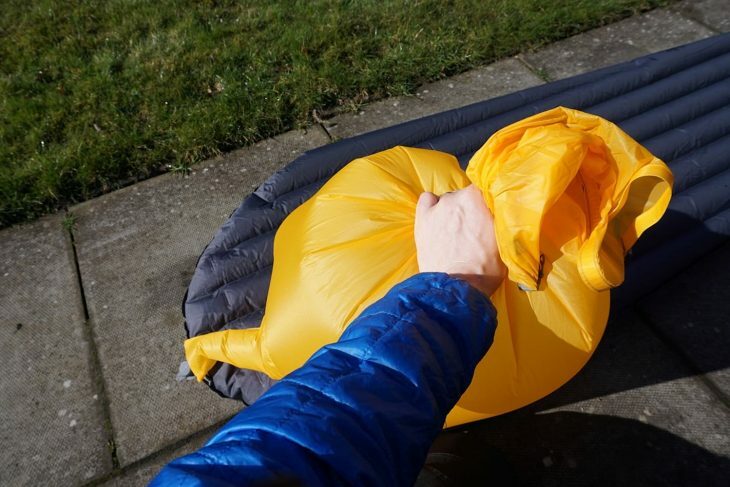 By inflating it so that it had a little give, I found myself sinking comfortably into it without feeling like I was close to touching the ground at any point. Some care had to be taken with the roll top closure as on more than one occasion, I found the bag deflated a little overnight. This I put down to operator error as I subsequently experienced no such problems on later trips. Useful top up and trim valve to get things just right, Goldilocks style! In terms of durability, the additional weight in the heavier 75D fabric makes for a robust feeling mat. I have confidence that this mat will give many years of reliable service. Deflating it is a breeze. Simply pop the clips on the seal et voila. A rush of air and you are ready to pack the mat away for your next adventure. I did notice some moisture build up on the inside but this was a big improvement on previous blow up mats I have used. So Who Should Buy This? If you like to travel in a bit of luxury, are a family camper or just love tech, this could be the mat for you. For the level of comfort on offer, it is not hugely expensive and is likely to give you many happy years of service. It isn’t a winter specific mat but for most folk here in the UK, that isn’t really an issue. Built in mini head rest. 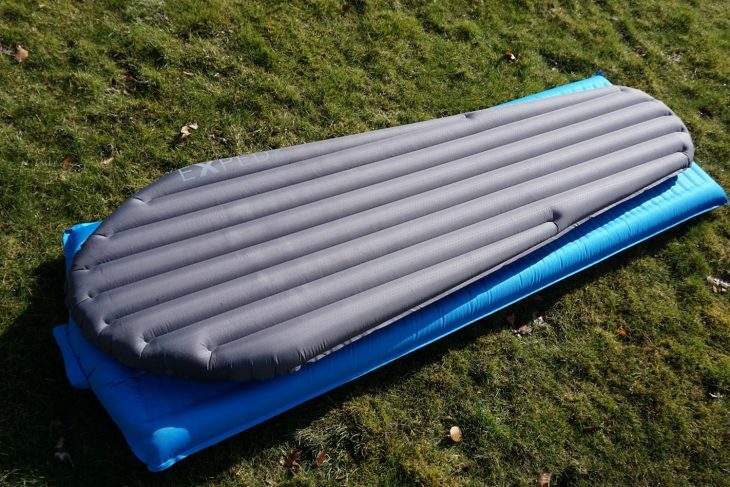 Exped and Thermarest have developed two different approaches to mat design and how to inflate them. The new technology is a far cry from the first inflatable mats I used and both designs are a reminder of just how far we have come in a very short period of time. For the winter camper, the Exped should be at or near the top of a very short list of which mat to choose. The warmth to weight ratio is incredible and it has proven to be a robust, reliable and comfortable companion. There is no getting around the price but I quickly forgot about that while lying on hard frozen ground on winter camps. No more uncomfortable nights in sub zero temperatures for me. The schnozzel bag inflation system is both the fastest and easiest I have ever used. If you want the best, this is probably it. Ebony and ivory live together in perfect harmony – or grey and blue to be precise! For someone for whom weight and packed size aren’t the be all and end all, the Thermarest is worthy of your consideration. I loved the design and comfort of it and it comes in at a reasonable price for the technology on offer. 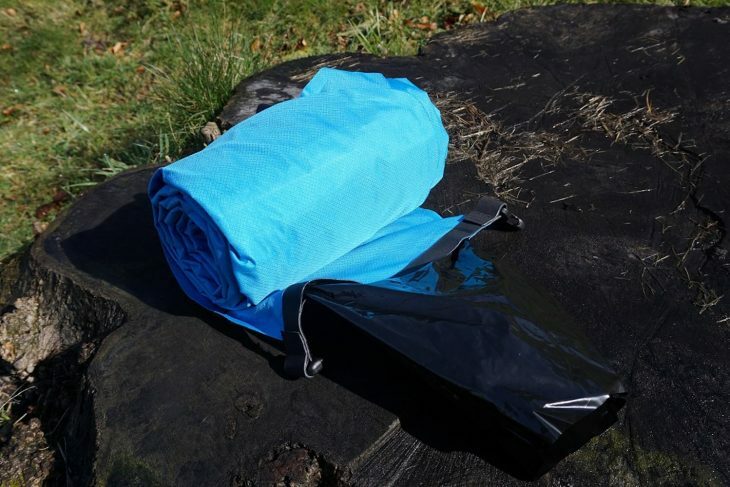 It wouldn’t be my choice for bikepacking due to its weight but as an all-round mat for use in the UK for basecamp trips, car camping and the odd bothy trip, it is a cracking option to consider. The inflation system never ceased to amaze me although it did take a bit of practice to perfect my blowing technique. The technology is filtering down to lighter weight offerings from Thermarest which make them a much more interesting proposition than previous designs. Definitely worth a serious look. 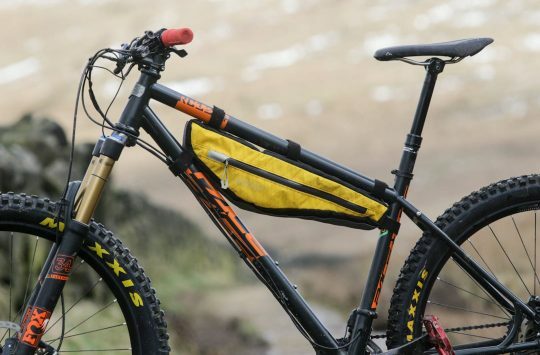 Apologies as this slightly off topic – A comfy night’s sleep bikepacking? Take a hammock. Why do you always pick things that are so expensive? You guys don’t really live in the real world do you. In the video, there is also a review of the Numo. 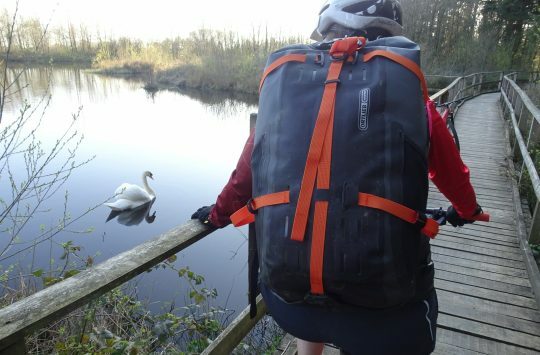 I really like Alpkit gear but the Numo has left me a bit underwhelmed. It is too short for my 6 foot 1 frame so that either my head or feet hang off the end. Width wise, weight is saved by making it narrow which saw me roll off it several times while sleeping. There is an attempt at insulation but it only covers part of the body and the bonded through design means that even with the insulation, I could feel cold spots right along the length of it. It also filled with condensation from my breath. The other two designs pretty much eliminate that, especially the Exped. I got tired of waking up either off the mat on the ground or just feeling cold through the mat or with my feet touching the cold ground. I used the Numo quite a bit but in the end gave up on it. It doesn’t cope well when the temperature drops and it is the least comfortable of the three by some margin. Would I buy one? No is the honest answer. It is just too compromised for my needs. It is massively cheaper than the other two mats but that is about the only thing in its favour. I never got a good nights sleep on it so from my perspective, it doesn’t do what it should. Alpkit do other mats which in my opinion are far better. Good point about the price of the mats tested. The Exped is a top end option but for winter camping on snow and ice, it delivers. The technology is available in much cheaper mats from Exped but I was testing their model designed for extreme conditions. The basic design is the same for the more budget conscious user. The same goes for the Thermarest albeit it is already a much lower price. There are some things I can happily compromise on but a good nights sleep isn’t one of them. One for the hammock brigade! 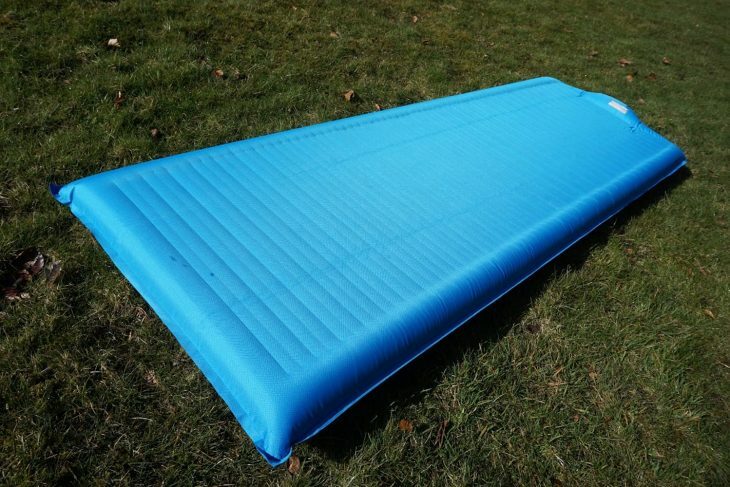 I have (or maybe had..) an Exped downmat and agree with Sanny’s review. Kayaking in Iceland I was the only one who was warm, despite others having the same weight sleeping bags. Unfortunately, last weekend I was woken by two small explosions, and found that one of the vertical baffles had failed, resulting in two normal sized chambers becoming one large chamber – it was like sleeping along a log. I’ve heard of this happening to others. Exped’s UK agents tell me that (at 25 months old) it’s covered by warranty, and I’m waiting to hear from the shop.